Also known as corporate occupiers and corporate tenants forming the industry's demand side. These members are executives who manage real estate and related assets for companies whose primary business focus is not corporate or commercial real estate (CRE). Financial institutions, technology, energy, transportation, and consumer manufacturing are among the sectors represented in this category. Also known as strategic partners and outsourced service partners forming the industry's supply side. A wide diversity of mainly commercial real estate interests populates this category of membership. CRE industry segment and disciplines represented include architects, brokers, contractors, developers, energy management, investors, landlords, owners, site selection consultants, sustainability, technology, workplace design and furniture, and many other parts of the CRE supply chain. Also known as community development, as well as local, state or regional economic development corporations (EDC's), also on the CRE industry's supply side. EDC's connect to CoreNet Global mainly from the standpoint that economic development and location strategies are an important part of the corporate end-user focus. EDC involvement includes government agencies, Chambers of Commerce, public-private partnerships (PPP's), universities, and many other interests. Also known as young professionals or emerging leaders, Young Leaders may be corporate end users, service providers or economic developers. 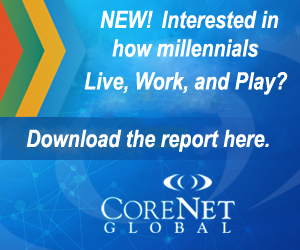 Young Leaders are CoreNet Global members who are 35 years of age or younger. Many have already attained executive leadership positions within their companies or organizations. Academic Members are educators at a college or university who spend not less than eighty (80) percent of their time researching or teaching in the field of real estate, corporate real estate or real estate related education. Student memberships are intended only for those new to the profession, who are enrolled full-time in degree-granting programs with accredited colleges or universities that include real estate or real estate related fields (exclusively online universities are not recognized at this time). To qualify for a Student membership, the applicant, along with their online or .pdf application, must present proof of class registration and a Student ID card that confirms current enrollment dates (past classes completed do not qualify). Questions about your status? Contact membership@corenetglobal.org. Available for full-time journalists working for a publication company. Must submit a letter on your publication’s letterhead, signed by your immediate supervisor verifying the nature of the business as a publication company, join by phone or email only. Available for our former active members only. In order to receive this rate, a person must have been a member in good standing for a minimum of five years. Must submit a letter from your last employer confirming your retired status, join by phone or email only.